Honestly, I don't give a fig about strangers judging how I parent my autistic son. I know I'm doing my best with all three of my kids, and am also constantly learning from my mistakes. Plus Leo has the same right to be in public as anyone, as long as (also like anyone) he's not being disruptive. If he's having a hard time, there's always a good reason, and we move on. 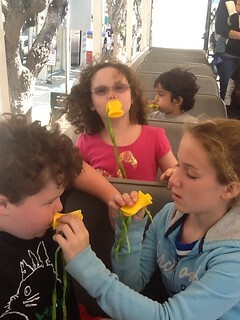 [image: My three kids using yellow "quacker"
What I do care about is how strangers respond when Leo needs accommodation. And a few months ago, when I reluctantly pulled out the autism card to ask if Leo could jump the queue for a public restroom, a stranger lectured me on how autism did not justify my request, and that furthermore I was teaching my son bad behavior by asking for special treatment. Yeah. How's that autism awareness working for you? You have to understand: that scenario was one of my worst parenting nightmares, even before the confrontation. I do everything possible to avoid being stuck in public without easy access to restrooms, because Leo can't always tolerate waiting in line. We have a clear best-practices strategy to avoid snafus: everyone makes a pit stop immediately before we leave, and pre-excursion water intake is limited. But, no one can fully regulate nature's call. So you can imagine my amplified anxiety when, despite our precautions, Leo told me he needed to go during a bustling afternoon at Fisherman's Wharf in San Francisco—just as we were about to board a tour. The tour staff told us there were only two public options in the entire area: the visibly over-full public restroom across the street, or the adjacent fast food restaurant. I dragged the kids out of the line and into the restaurant, where we ran smack into a wall of Autism-Is-No-Excuse. Why wouldn't that man believe me? In what universe do people deny accommodations to disabled children? I'm still in shock. All I can think of is that, at the time, Leo was "passing." At the time, there were no indications—other than me tightly holding my eleven-year-old son's hand —that Leo is autistic. The man did not try to converse with Leo, and Leo was not stimming, humming, or being his version of silly—or melting down because he needed to use the bathroom and was being blocked. My son did not appear disabled. And that's the difference between autism awareness and autism acceptance, between knowing that autism exists, and understanding what it means: that a child can be hyper-verbal yet not grasp when or why other people expect them to say "please." That an adult can communicate more fluidly via email than by speaking—if they speak at all. That a too-noisy room can shut down autistic people of any age. And that a cheerful pre-teen boy like Leo sometimes really can't wait to use the bathroom. That stranger obviously knew the word "autism," he just considered it a soft option. This is why I continue to advocate for autism acceptance instead of autism awareness, because awareness wasn't exactly helping Leo that day. I'm aware that people tend to turn feral in touristy areas, but even so the incident shook my faith in social contracts. Perhaps I walk in a bubble, but I believe people will not ask for accommodation unless they need it. Does being an earnest fan of the Golden Rule make me naive? Thankfully that man did not have the power to ruin our day, because other people do believe in accommodation and social contracts. Leo was able to wait a bit, and the next person in line let our boy go to the front (we thanked him profusely). And even though we missed our scheduled tour, the very understanding staff put us on the very next ride. 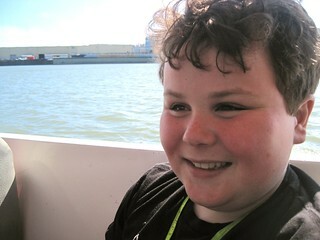 We still had a great time, riding amphibious vehicles all over our fair city and right into San Francisco Bay. Please, if someone tells you they or their child desperately need accommodation -- please try to do what they ask. Even if you can't tell by looking that they have special needs. And especially if they are as wild-eyed and frantic as I'm sure I appeared that day. Try to understand that it is mortifying to ask in the first place -- I knew everyone else in line was there on urgent business, too. But please, please: try to believe in me, and my son, as we believe in you. A version of this essay was published at BlogHer.com.